Haley, you have a great voice, literally & metaphorically, to convey a story. I’m wondering at what level in an organization can conscious capitalism start. Is it just business’ leadership that drives this or can it start at a “grassroots” level within a business? Can or should workers start this messaging or is driving “consciousness” the domain of leadership only? Thanks for listening and continuing the conversation! 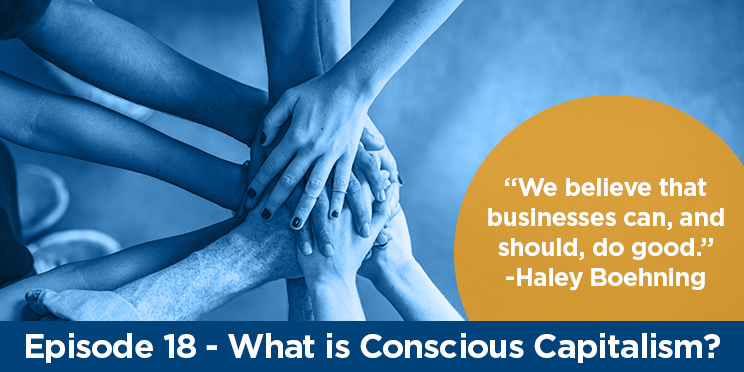 Everyone can play a role in raising consciousness within a business … including employees, leaders, customers, shareholders and even neighbors in the communities where businesses operate. Where the insights come from first will be different for every business … sometimes it is a leader’s recognition first of the importance of higher purpose to customers, for some it is listening to employee feedback and understanding the importance of a strong culture and positive employment brand on bottom line performance, for others it may be observing the connection between profit and strong servant leadership in other companies and being curious about how to benefit from the same in one’s one. Wherever its starts, all roads lead back to raising consciousness through curiosity.